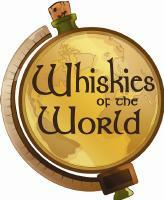 Thank you very much to Whiskies of the World for the opportunity to attend the 2011 Expo as press. What a difference a year makes! 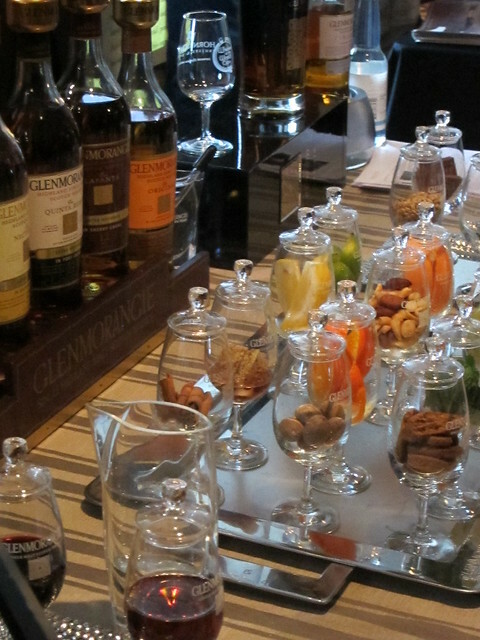 Last year’s Whiskies of the World Expo (let’s call it “WoW”, shall we?) was saddled with problems thanks to the previous owners and a sub-par venue, not to mention the kinks that a new owner of a show has to work out. I’m glad to say that WoW came off much, much better this year and was well worth attending. 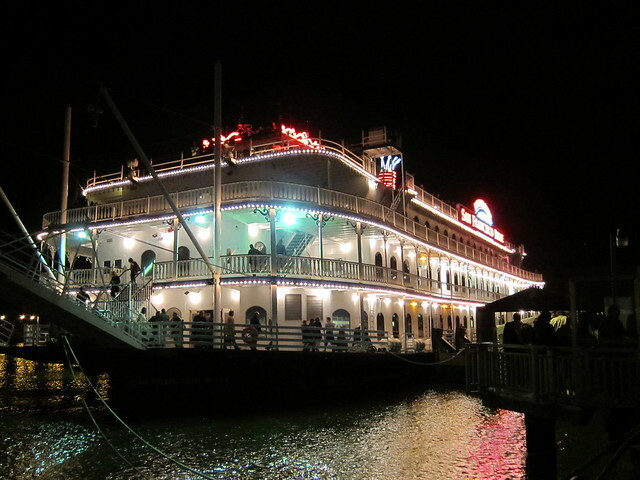 The biggest difference was the venue change from the usual boring hotel ballroom to the lovely San Francisco Belle, a stern-wheeled riverboat from the late 1800’s that’s part of San Francisco’s Hornblower fleet. 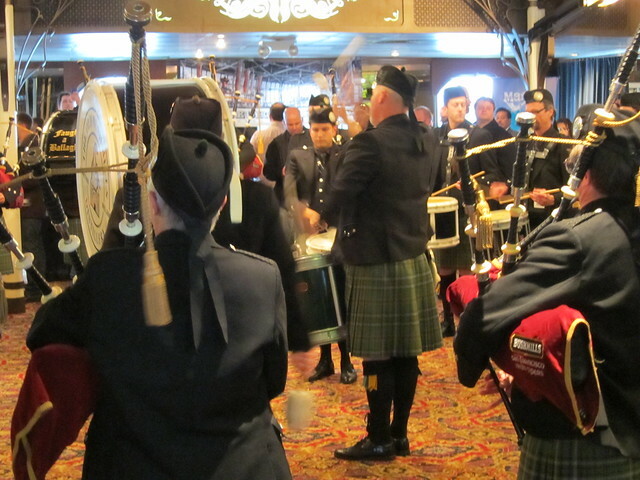 The show was arranged on all four decks with whiskies and seminars on two decks, seating and buffet on another and cigars on the sundeck. It really was a terrific setting to walk around and sample whisky in, though the gentle sway of the dry-docked boat kept making me drunk I was thinker than I thought I was. The show was crowded but reasonably so, beyond the booths there was plenty of room to move around and there was never much of a wait to get a pour. The selection ranged from the expected to the new and unusual with a nice smattering of whisky-related products alongside the bottled ones. There were lots of American whiskies, and in particular a lot of great stuff from smaller “craft” distillers. I was able to have several good conversations with distillers and reps, the only downside there is that I missed attending one of several seminars and master classes. The line for the general admission ticket holders did seem long right before the 6:00 opening, hopefully it moved quickly once the gates swung wide. So, yes, congratulations to Whiskies of the World for re-bounding and putting on a great event…now let’s get to the whiskies! Douglas of Drumlanrig 27 Year Old Port Ellen. Expected greatness is still greatness. I need to win the lottery more often to afford this kind of thing. Cask’s Six Year Old Single Barrel Willet Bourbon. Big, bold stuff, but smooth and complex especially with bit of water. Glenglassaugh 26 Year Old. 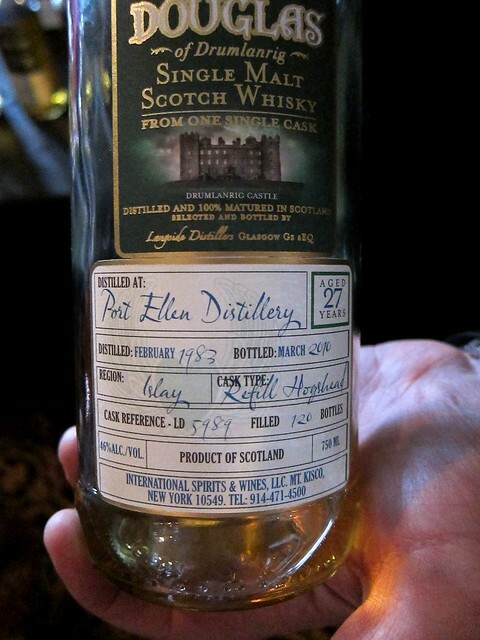 A wonderful treat from the stocks of closed distillery, recently purchased and re-openened. Old Pultney 17 Year Old. A briney, wild-ish malt evocative of its Highland coastal location. Micheal Collins 10 Year Old Single Malt Irish Whiskey. Good stuff, another peated (albeit lightly) Irish is a very welcome thing. High West Double Rye, a 2yo rye + a 16yo rye. Spicy and bold as well as mature and complex. Since we’re not exactly overwhelmed with huge, diverse selection from independent bottlers here in the states, the new Douglas of Drumlanrig line from Douglas Laing is a welcome addition. Along with aforementioned Port Ellen, there was a very different, herbal Fettercairn 9 Year old and a unique, fruity, almost grappa-like Clan Denny 30 year old North British Single Grain. Douglas Laing certainly has the stock to release some impressive casks, so it will be really interesting to see what other non-chill filtered malts come out under this brand in the coming years. Shuttered since 1986, Glenglassaugh was sold in 2008 by Highland Distillers to Dutch investment house Scaent. Included in the sale was the stock of old casks which the distillery has been able to release over the last couple of years, including the delicious 26 Year old. Managing Director Stuart Nickerson was on hand to show off not only the older expression but four new spirits from the re-started stills. Moving through the Clearac, Peated new make, 6 month old “Blushes” (aged in red wine casks), and 12 month old “Fledgling XB” (aged in ex-bourbon casks), it was very interesting to see not only the developement of a new whisky but that due to Nickerson’s adherence to as much tradition as possible, many of the same elements that made up the older expressions were found in the newer spirits as well. A rare opportunity to try several youngin’s from one distillery. Local favorites St. George Spirits in Alameda had a few surprise bottles along with their usual line and thanks to distiller Dave Smith I was able to try a smooooooth 10 year old malt which is one of the components that goes into their St. George Single Malt, as well as a couple other cask strength barn-burners that proved to be the most interesting pours of the evening. If you’ve taken the tour at St. George (go take it, if not), you know that they revel in a bit of mad-scientist experimentation. One such trial is a four-grain, five month old bourbon-to-be which reminded me of Anchor’s 18th Century Spirit in its raw, green graininess. Then there was the surprise hit of the evening for me. Five years ago, they bottled a spirit distilled from a wash made from Sierra Nevada‘s Celebration Ale and Pale Ale, and while the first couple of years led them to believe they’d wasted a few barrels and a lot of beer making the stuff, it’s settled down nicely and is now an eyebrow-raising, preternatural whiskey that is so beer-like and hoppy it almost sent me running for a pint glass. I’m not sure it’s something I’d drink everyday, but its uniqueness paired with the developing maturity was a treat to try. Word is St. George is considering releasing special batches of this kind of thing. Based on the bottle tried here, I’d think that’d be a big success. It was also a treat to spend some time with the incredibly affable and generous David Perkins from High West. He was awarded Malt advocates’ Pioneer of the Year award this year which proved to be mildly controversial, but in my book, well, well-deserved. Though they do a bit of distilling themselves, High West has made no secret of being basically a blender of American whiskies while other small distilleries tend to gloss over that fact that they don’t make all the stuff they bottle. It doesn’t hurt that High West is doing this exceedingly well and bottling some incredible stuff. On hand they had the recent, powerful Double Rye, a mix of 2yo and 16yo ryes, the more mature, laid-back Rendezvous Rye which is a mix of 6yo and 16yo ryes, Bourye, a delicious marriage of 10yo bourbon and 16yo rye, and their oatmeal-cookie-in-a-bottle Silver Oat Whiskey. Mr. Perkins is in love with this whiskey thing, he brings such passion, enthusiasm and knowledge to the table, it’s easy to see why his whiskies are such a success. Douglas of Drumlanrig has been making the rounds in NYC for about a year now. So far I’ve been pretty impressed with the variety of stuff they are able to put out. I have a bottle of the Douglas XO blend and am saving up for a couple of their single malts. Great recap of WoW! It left me questioning my strategy for next year. I definitely spent too much time at seminars this year and missed out on some great pours on the floor. I’m thinking the VIP ticket is worth it just to get in an hour early. It might make sense to just pack a dinner instead of lining up (20 minutes to get food! ).